We can’t deny that dental technology has advanced over the years. Few years back, we couldn’t have imagined a set of white teeth for an extended period but now we can. Thanks to Braun and its sister brand Oral-B, we can take better care of our teeth and gums in our mouths. Specifically speaking, the 3000 Pro and 5000 Pro are two of the models that can take care of all our brushing needs and ensure gum protection at the same time. Then, why am I babbling about Oral B 3000 vs 5000 comparison you ask? It’s just so that people can compare between the two products (read: split the hairs), buy the best one tailored to their teeth, and save some money in the process. Without spinning the wheel any further, let’s get on with the topic. How Did My Time with Oral-B 5000 Pro Go? The Differences that I Found! Which One of the Two Performs Better? When it comes to electric toothbrushes, very few brands can duke it out with Braun. The credit of being a “Near Perfect” brand goes to its Oral-B toothbrushes. Especially, Oral-B Pro 3000. It gets to work from day one by removing stingy surface stains. People won’t even have to put extra effort for the job. This little brush features a “Cup” design. Bristles surround your teeth. They polish, vibrate, and pulsate in regular intervals to provide users the best brushing experience possible. One thing good about this piece of technology is that it has a timer built in. This nifty timer beeps every thirty seconds. Thus, the users are always in the loop regarding when to switch sides and brush the other half of the teeth in their mouths. Talk about ensuring proper cleaning! However, it doesn’t stop there. Oral-B Pro 3000 comes with as many as three distinct modes. These different modes take care of your teeth through different brushing techniques. For example, the first mode is “Daily Clean Plus.” It’s the normal mode with a twist. The 3000 model from Oral-B comes with a pressure sensor. It lights up whenever someone is exerting too much pressure on his/her teeth than usual. Another mode that people can utilize is the “Sensitive” mode. Tooth sensitivity is a common term for us. We all know the implications of this conditions and the troubles it brings. Thankfully, with this mode of gentle brushing people won’t suffer from toothache, bleeding or gum problems. Want more on gum care? Well, this thing comes with a “Gum Care Massage System” that gently takes care of all the problems without causing the gums to swell. One good thing I frequently took advantage of is the Bluetooth technology. 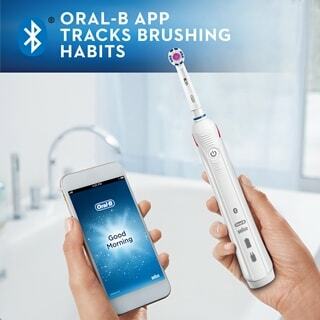 This thing allows you to connect the Oral-B 3000 with an app. With this, one can customize brushing routines, set alerts to accomplish different goals that he/she may have. The handle of Oral-B Pro 3000 is unique. It sets itself nicely with every Oral-B head that you can imagine. Be it FlossAction, Deep Clean, Gum Care, 3D White or PrecisionClean; the handle accommodates all. At this point, I don’t think that I need to mention that the Pro 3000 has a rechargeable battery. There’s a brush stand included with the product. The stand acts as a charging station as well. I got to work with a brush that’s compact in size and is loaded with beneficial features for laymen. The product starts working from Day One. No prepping is needed for this thing to kick off. Multiple modes of brushing takes care of all sorts of mouth conditions users might have. I like the brush stand. It doubles as a charging station as well when you need it to. The rechargeable battery is NOT designed to serve Oral B 3000 Pro for a long, long time. 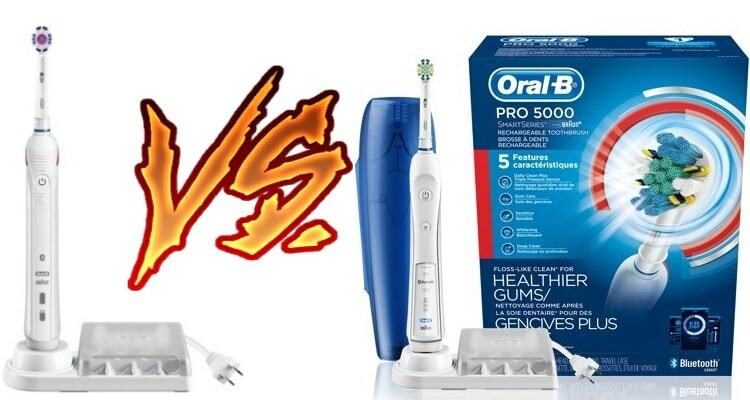 Oral B 3000 vs 5000 comparison won’t be complete without the other side of the coin, will it? That’s why I bought this SmartSeries toothbrush from Braun and gave it a go for a few months. As it turned out, the overwhelming popularity has its reasons. The primary one being its Bluetooth connectivity. Now, hold on, it was in the earlier 3000 Pro model too! What’s different here? As it turns out, It’s several notches better. For example, you get to program your brushing routine, keep track of your daily progress towards the ultimate shining teeth, and track the total progress also. One good thing I found here is that users can follow the footsteps of a dentist in using the product better. As a result, people will be able to utilize numerous features better than before. Did you know that the smartphone app which pairs with the brush using Bluetooth shows pressure applied on your teeth as well? Yes, besides having a separate pressure indicator, this extra feature of the app helps people in understanding the mechanism better than before. This little thing comes with a FlossAction brush head. The head is great as it is but then you have micropulse bristles. These bristles tend to vibrate when people are brushing. This allows the Oral-B product to go the extra mile when it comes to cleaning the inside of our mouths. What you have is the luxury to play with 3D cleaning action. It’s the heart of the product which makes it tick. It does so many things like oscillating, rotating, and pulsating. It might not look like much but the dirt, stains, and plaques break up. As a result, these things become easy to remove. All in all, this little brush comes with five different modes. These modes help the users in cleaning their mouths effectively. At this point, I don’t need to mention that this nifty brush carries a pressure sensor that lights up when too much pressure is put, do I? I guess not. Yes, the model comes with a brush stand that doubles as a charging dock. You have an improved battery that gives Oral B 5000 Pro the legs to go through several sessions without a drop in performance level. However, I found that the charger only supports 110 to 130V of current. That means, you cannot use this outside the USA (that’s a bummer). Also, the brush works on the principal of “One App per User.” Meaning, if you want to use the app for multiple users, buy multiple brushes. 5 different modes give you a broader range when it comes to taking care of your teeth. You have a battery that functions well beyond expectations and is rechargeable as well. The body of the brush fits with the standard and the specialized Oral-B brush heads. Micropulse bristles help users to get the plaque, stains, and bacteria off their teeth. 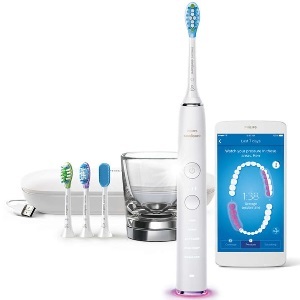 Oral B 5000 Pro comes with a Bluetooth connect technology as well as an app to monitor everything. The Bluetooth connect technology works for one brush only and you need to buy additional brushes for more people. Before I go into the nitty and gritty of these two things, let me first confront the similarities these products have. Let me tell you, these two models are remarkably similar with subtle differences. Let us explore them bit by bit. First similarity I found with these models is that you have the Bluetooth technology at play. Both these brushes come with apps that you can connect to. Feel free to customize your brushing routine and the way you brush with the products that too without any problems. Both these machines come with pressure sensor technology. When you apply too much of a pressure, the machines can tell just by the signs. They can also tell when you are brushing normally. The 5000 Pro takes this pressure sensing to the next level with showing it as part of the android app. The motors of these to machines are similar in nature too. They have the same quirks. That means, you get 40,000 micro vibrations and 8,800 oscillations per minute. Thus, one can get sparkling teeth by brushing for only two minutes in total. There’s a time-keeping system that allows people to never brush for more than 30 seconds on either side. Both the brushes come with nickel Metal Hydroxide batteries. These batteries can be charged using a charging dock or a stand. The outlet works with 110V to 130V connectivity. Both these devices are not suitable for using outside the USA. I suggest you use a voltage power adapter when traveling. Both these machines come with additional brush head compatibility. These products come with compartments in the brush case for people to put these brush heads in. Plastic-made case is remarkably sturdy. One can utilize the space to put as many as four different brush heads. When not using, simply put it away. Lastly, Oral-B 3000 Pro and Oral-B 5000 Pro come with 2-year warranty (last time I checked) that covers all sorts of manufacture faults. But bear in mind, the warranty doesn’t include user inflicted damages. Oral-B 3000 Pro and the 5000 Pro do have their differences but these are sometimes too subtle to notice. There are some glaring differences as well. Let me spell the beans in the next section. 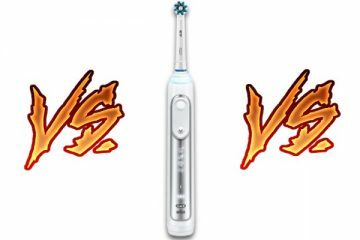 Let’s kick-off Oral B 3000 vs 5000 comparison with the most obvious difference. This is, the difference in modes. One has the chance to play with three modes when working with the 3000 at hand. 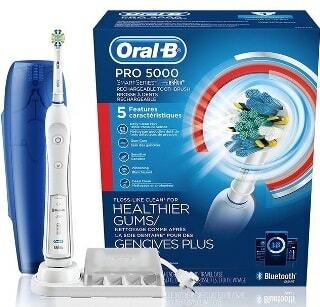 With Oral B 5000 Pro, the modes are five in number. I’d advise people to opt for Oral B 3000 when constrained by budget. However, if you want greater customization and extra care, go for the 5000. In addition to Daily Clean, Gum Care, and Sensitive teeth, people have deep clean and Whitening to work with. First three deal with speed of brushing. The last two are extra buffs that are normal to high-end brushes. Default brush head for 3000 Pro and 5000 Pro are different as well. You have the conventional 3D Action brush head with the earlier variety. 5000 Pro comes with a Floss Action Brush Head. But both the brushes are compatible with all the brush heads Oral B has on offer. Both the models feature similar kind of batteries. Both the batteries come with a brush stand AKA the charging dock that people see. However, there’s a tiny difference. The difference lies in charging duration. Oral B 3000 Pro’s battery can hold the charge for a little over 7 hours before needing to be recharged again. The 5000 Pro can run beyond 10 hours in between charges. Recharging doesn’t take that much time either. Yes, you get a travel case with Oral B 5000 Pro. With the 3000 Pro, it’s not the case. The travel pouch gives a user an extra cushion against damages. Also, one can carry two brush heads with this travel case. Individual parts are tightly secured within the package and protected against shocks. Undoubtedly, this packaging system makes 5000 Pro makes it pricier than the 3000 Pro. But the price is a small tribute to pay when you consider different modes, the convenience of switching between them, and the case you have at your disposal. All of these things add up to make the latter variety a fantastic product. Normally, the extra price is due to the buffs that Pro 5000 provides. Both the brushes are neck and neck when it comes to features. My solution when dealing with neck and neck products is to go for the latest model. The travel case is a factor as well. Also, five different modes are not something I’m going to leave out of the equation. I know, not all of us are fans of extra modes. But passing out on extra battery life and an extra cleaning mode. These things might seem too small but Oral B cares. People tell me that the 5000 Pro is bulkier than its predecessor. But that’s one flaw I want to overlook in this Oral B 3000 vs 5000 comparison. 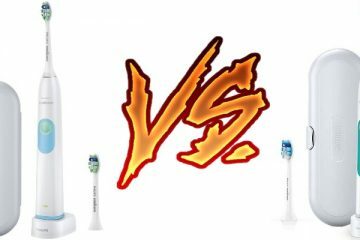 Oral B 500 vs 1000 vs 1500 : Which One Wins the Bout? 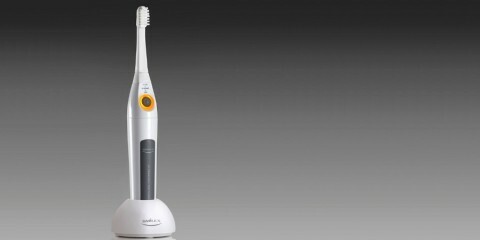 Philips Sonicare 2 Series vs 3 Series: Which is Better?